1855: born in Edo in the district of Asakusa Umamichi. Son of the tateshi Bandô Santarô. 1860: he becomes disciple of Ichimura Uzaemon XIII, who gives him the name of Ichimura Nagamatsu. 1862: he becomes disciple de Bandô Hikosaburô V, who gives him the name of Bandô Utasaku. 1868: tour in Kamigata with his master. 1870: he becomes disciple of Kawarasaki Gonnosuke VII. 1872: he takes the name of Yamazaki Ennosuke. 1873: Ennosuke plays without his master's permission the prestigious role of Benkei at the Nakajimaza (Tôkyô) in the dance-drama "Kanjinchô". This is a lese-majesty crime and the sentence is irrevocable: Ennosuke is expelled from the Kawarasaki clan. He has to give up the Yamazaki name and takes the name of Matsuo Ennosuke. January 1884: he achieves a great success in Ôsaka at the Nakaza, playing the forbidden role of Benkei in the dance-drama "Kanjinchô". October 1890: Ichikawa Danjûrô IX forgives him and accepts to reintegrate Ennosuke in the Ichikawa clan; he takes the name of Ichikawa Ennosuke I. March 1891: premiere at the Kabukiza of Fukuchi Ôchi's drama "Buyû no Homare Shusse Kagekiyo", a revised revival of Chikamatsu Monzaemon's jidaimono "Shusse Kagekiyo"; Ennosuke plays the roles of the plasterer Kyûsaku and Kajiwara Heiji Kagetaka [casting]. This is also the celebration of Ennosuke's success at the nadai exam. November 1893: Ennosuke takes part in the opening ceremony of the Meijiza [more details]. January 1896: revival at the Harukiza of the dance "Kashiragaki Ise Monogatari", staged under the title "Noriaibune Ehô Manzai", with Ennosuke and Nakamura Kangorô XII performing the two comic dancers. April 1897: premiere at the Kabukiza of Fukuchi Ochi's drama "Otokodate Harusame Gasa"; Ennosuke played the role of Henmi Ikkaku, later the rônin Henmi Tetsushinsai [more details]. July 1901: premiere at the Tôkyôza of "Tsuri Onna", the Kabuki version of the kyôgen "Tsuribari", originally written in 1883 by Kawatake Mokuami (lyrics) and Kishizawa Shikisa VI (music) and revised for the stage by Takeshiba Shinkichi. It stars Ennosuke and Nakamura Kangorô XII in the roles of Tarôkaja and the ugly girl. March 1906: Tsubouchi Shôyô's drama "Hototogisu Kojô no Rakugetsu" is produced for the first time in Tôkyô, at the Tôkyôza; Ennosuke plays the roles of Katagiri Katsumoto and Ujiie Naizen [casting]. November 1908: revival at the Kabukiza of the Kabuki Jûhachiban drama "Kagekiyo"; Ennosuke plays the role of Hase no Hachirô [casting]. April 1910: premiere at the Kabukiza of "Yuki no Yûbe Iriya no Azemichi", a few scenes taken from "Kumo ni Magou Ueno no Hatsuhana" focusing on Kataoka Naojirô and his lover Michitose and staged independently from the rest of the play; Ennosuke plays the role of Kaneko Ichinojô [casting]. October 1910: Ichikawa Ennosuke I and his son Ichikawa Danko I respectively take the names of Ichikawa Danshirô II and Ichikawa Ennosuke II at the Kabukiza. The two actors play together in the drama "Kiri Hitoha" and the long-forgotten bombastic drama "Kamahige". The name Danshirô was not held since 1695. The new Danshirô revives the yagô Omodakaya. April 1912: premiere at the Kabukiza of the dance "Hashi Benkei"; Danshirô plays the role of Benkei [more details]. October 1913: revival at the Kabukiza of the drama "Zôhiki", which belongs to the Kabuki Jûhachiban; Danshirô plays the role of Mita no Genji Takeru [more details]. August 1917: the drama "Natsu Matsuri Naniwa Kagami" is produced at the Kabukiza for the first time; Danshirô plays the role of Mikawaya Giheiji [casting]. September 1919: premiere at the Kabukiza of the Kiyomoto-based dance "Sumidagawa" (a Nô adapted for Kabuki by Yamazaki Shikô with a musical accompaniment made by Kiyomoto Umekichi II); Danshirô plays the role of the boatman [casting]. November 1919: Danshirô plays at the Meijiza the role of Shunkan in the drama "Heike Nyogo no Shima". 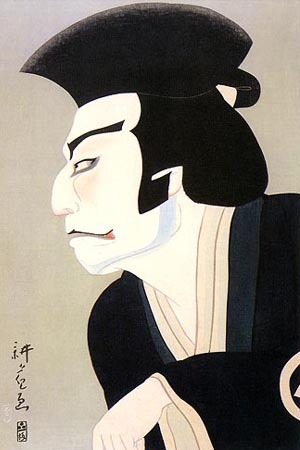 Ichikawa Danshirô II was a talented actor, the founder of an original line of actors. He excelled in both dances and jidaimono dramas (especially the gidayû kyôgen). He rebelled against the Kabuki feudal system and his expulsion from the Ichikawa clan led him to walk his own way in koshibai or on tour in provinces. He was finally reintegrated in ôshibai and helped to fight the existing discrimination against koshibai actors.